So for some truly random reason and using time I can ill afford to waste, I decided to sign up for Blogging 101…several months after I had started blogging. Somewhat like fishing out the car manual after having started up the car and driven it down the driveway onto the main street. So assignment #1 is to explain why I write; I assume the question is why i actually blog. So for people who have read my previous posts you will know that I blog for a very simple reason – I believe in low carb living but there are very few Asian low carb websites or recipes, so I decided that this would be my niche message. So there he is. My one and only bestest dog friend who was such a perfect dog that I haven’t had the heart to find a replacement for him. The picture shows Plato, a mixed breed dog and best companion for my teenage and young adult years. This picture was of him on my wedding day. 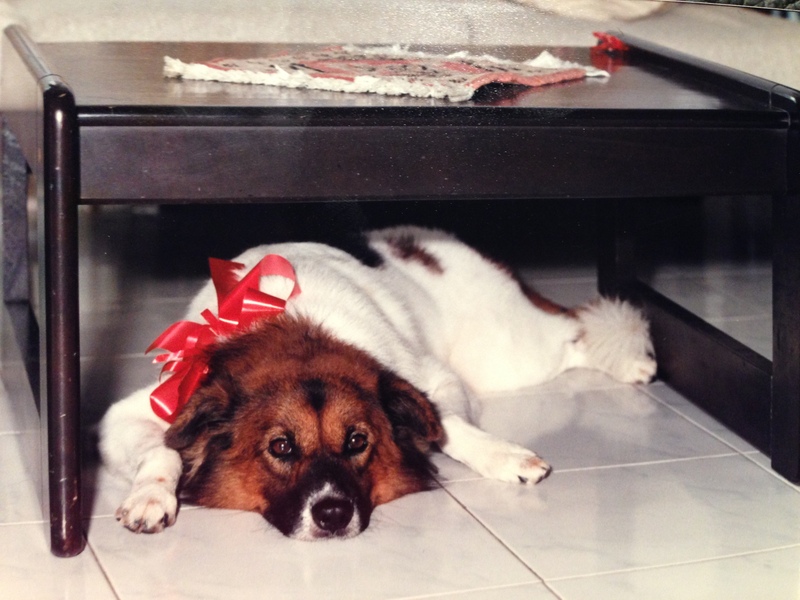 My brother had tied a ribbon round his neck for the occasion, but Plato had retreated under the table because he was in shock – he didn’t recognise me and couldn’t reconcile the usual T-shirt-and-shorts me in a wedding dress. But back to the low carb Asian thing. And why I mentioned my dog in the first place. Plato lived a good 17 years and I think part of the reason why he lived such a long and healthy life (hardly a visit to the vet except for vaccinations) was that he ate well and exercised lots. We lived in a bungalow with a long garden parallel to a long windy road, and everyday he would race up and down the garden, keeping pace with the newspaper man, the garbage pick up and miscellaneous motorcycles and people walking along that street. And he did eat his vegetables too!. He was a durian aficionado, probably because we had a durian tree in the garden and he could pick out which durian fruit had the best seeds. He was in a constant battle with the squirrels who would bite through the durian husks while the fruit was still on the tree, retrieve the juicy seeds, eat the flesh and throw the seeds down at the poor dog who was waiting hungrily and angrily below. So living healthy in my book includes exercise, lots of vegetables and low carb magic. Today the recipe is a Chinese Spinach recipe which has become very popular in Singapore over the past few years. It is usually sold in restaurants as “Chinese Spinach in Superior Stock”. The fun part about this vegetable dish is that there are three kinds of egg inside the dish. Century egg is a rather unique Chinese ingredient – a preserved egg that has been seasoned with a weird chemical mixture of clay, ash, salt, quicklime and rice hulls according to Wiki. Century egg has a kind of ammoniacal odour and taste and to this day I can’t quite explain why we love it so much, but then, again, we are the people that adore durians and smelly tofu…Salted duck egg is the next type of egg we use, which has a more straightforward and unidimensional flavour (it’s just salty egg, ok??). Although I have come now to appreciate how ducks eggs have a richer and gamier flavour than chicken eggs and it is no wonder when they are salted, bring a richness and meatiness to the dish. And the third egg is plain old fresh chicken egg. Why to Chinese call it “superior stock”? Actually, firstly the fact that there are 3 types of egg in a vegetable dish not only gives a high protein (and cholesterol) whammy, but this stock usually contains wolfberries, which are also known as goji berries. In the Chinese philosophy of health which is supposed to require a delicate balance of “heatiness” and “cooling” in the body, wolfberries are supposed to bring “heat” to the body, are anti-oxidant rich, improve vision and promote youthful looking skin (yay!). I think Chinese are not so paranoid about cholesterol but rather about whether the food affects the body’s “qi” (energy). 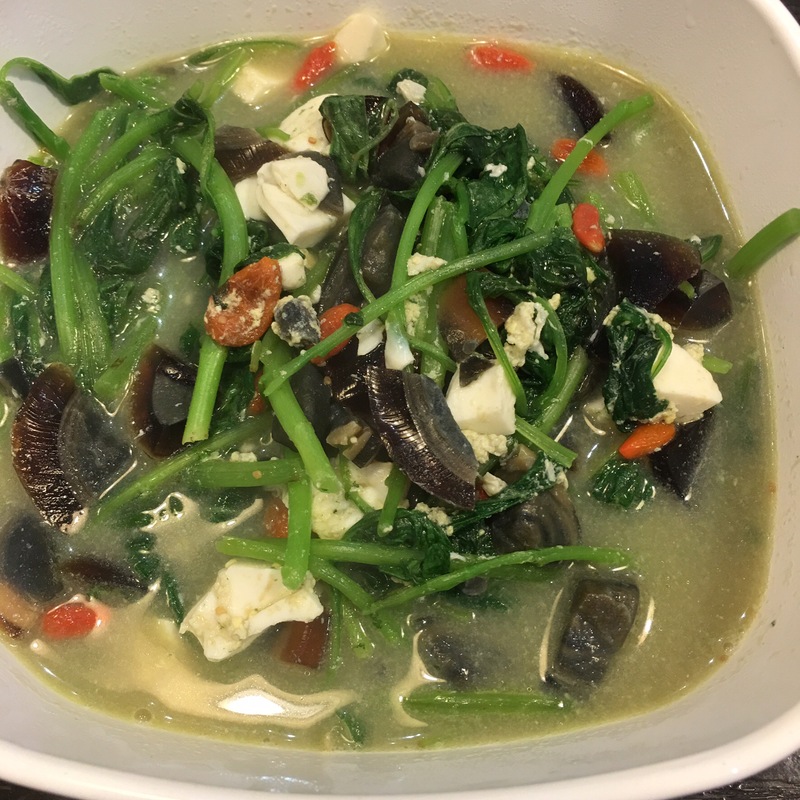 The vegetable used in this dish is Chinese spinach or a very tender kind of leafy green vegetable with heart-shaped leaves called “bayam” in Malay. Why is this vegetable dish low carb? Simply, most leafy vegetables automatically qualify to be low carb. The eggs are definitely low carb – a typical large chicken egg only has 0.6g carbs. So this is a high protein and fiber dish; the only scary bit is probably the century egg which you can probably cut down in amount if you are worried about the chemicals. So here is my version of Chinese Spinach with a trio of eggs. My kids adore this dish and it disappeared amazingly quickly last night at the dinner table. Clean the spinach. Cut into 2-3 inch lengths and separate the stems from the leaves. Heat up the oil in a non-stick pot. Fry the garlic till fragrant and slightly browned. Sauté the spinach stems for 1 – 2 minutes. Add the spinach leaves to the pot and fry till just wilted. Add the chicken stock to the pot and simmer for a while. Add the century egg, salted egg and wolfberries and simmer for another 1 – 2 minutes. Add the wine and briefly simmer another minute.